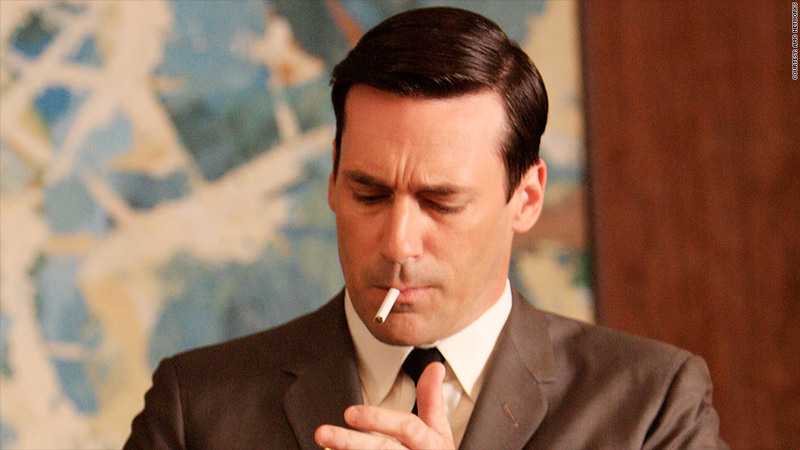 Don Draper and his colleagues smoke at work all the time on hit the show Mad Men, which is set in the 1960's. Joe Camel isn't going to be able to smoke at his desk any longer. Reynolds American, the nation's No. 2 tobacco company, will no longer let its employees smoke in most places at work starting next year. The company, which makes Camel cigarettes, is constructing indoor smoking areas for those who do want to smoke. But smoking traditional cigarettes, cigars and pipe tobacco at desks and in conference rooms will no longer be allowed, said spokesman David Howard. Employees and visitors will still be permitted to use smokeless tobacco, including e-cigarettes, at work. "We believe it's the right thing to do and the right time to do it, now that we offer a full line of smoke free products," said Howard. "It will make our work environment more inviting for employees and visitors who do not smoke." The proportion of Reynolds American employees that smoke is about the same as it is for the general U.S. adult population, according to Howard. The Centers for Disease Control puts that at 18.1% in 2012, down from 24.4% in 2005. The company has banned smoking in the cafeteria and fitness centers for a number of years. "This is really just an update to our current policy," he said. American Nonsmokers' Rights Foundation estimates that just less than half of the nation's workers are covered by laws that prohibit smoking in their work places. But the traditional tobacco states of Virginia, North Carolina and Tennessee have no such laws, according to the group. Reynolds American (RAI) is in the process of buying No. 3 U.S. cigarette maker Lorillard (LO) in a $27.4 billion merger that is expected to close in the first half of next year.